This is the first in a two-part series discussing how businesses are increasingly being held liable if their websites are not compliant with the Americans with Disabilities Act. The next post, "The Internet and ADA: How to Make Your Website More Accessible," will cover steps companies can take to make their sites more accessible. Since Congress enacted the Americans with Disabilities Act (ADA) in 1990, the Internet has profoundly changed the personal and professional lives of individuals in the United States. A large percentage of people with disabilities use the Internet at work as well as at home, and consumers with disabilities represented $200 billion in discretionary spending in 2010 according to a U.S. census report. Yet while individuals and companies today conduct a considerable amount of their daily business online, many websites still lack features that enable persons with disabilities to equally access information and services online. Many pages with video or other multimedia presentations lack captions that enable a person who is deaf to access information, do not allow users who have visual impairments the option to adjust font size or color contrast, and do not allow users the option to request more time to respond to time-sensitive features. A person who is blind might use a screen reader to access webpages, while a person with limited dexterity might use a keyboard alternative when browsing online. But many websites do not allow screen readers or other assistive technologies to retrieve information, most often because they fail to include corresponding text that describes what an image conveys. Similarly, many websites do not support keyboard alternatives to mouse commands, such as tab commands that allow users to scan pages without a mouse. Companies like Charles Schwab, Hilton Worldwide, Target, and Southwest Airlines have been the target of increasing litigation surrounding website accessibility; however, it’s not just large businesses that should pay close attention to their websites. 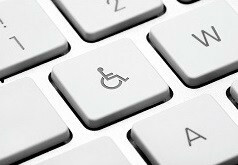 The Department of Justice (DOJ), which considers websites places of public accommodation under Title III of the ADA, has shown an increasing interest in ensuring that goods and services offered online are equally accessible to persons with disabilities. In 2010, the DOJ sought public comment regarding the development of its proposed website accessibility regulations, which would apply to businesses that provide products or services to the public through their websites. The regulations would not apply to individuals, nor would they require businesses to ensure that websites linked to their own—but that they do not operate or control—are accessible. However, if a site requires patrons to use another website in order to take part in its goods or services, perhaps by requiring payment processing on another website, the entity could be liable even if it does not operate or control the site. While some federal courts have held that there must be a nexus between a challenged activity and a private entity’s “brick-and-mortar” facility to obtain coverage under Title III, the DOJ’s proposed regulations would apply even if an entity operates exclusively online. The DOJ has delayed its target date for the regulations—now set for June 2015—several times. In the meantime, companies should pay careful attention to their websites and take measures to ensure they are accessible to persons with disabilities. The next post will review the DOJ’s most recent settlement and address what companies can do make their websites more accessible.